Albert Einstein is claimed to have once remarked, "Wood chopping is so popular because you can immediately see the results." At Gojer, Kärntner Entsorgungsdienst GmbH in Völkermarkt/Austria, however, wood is not simply chopped: railway sleepers and other waste wood are shredded in large quantities. For over a year, the Urraco 95 DK mobile shredder has been helping the firm tackle the task. 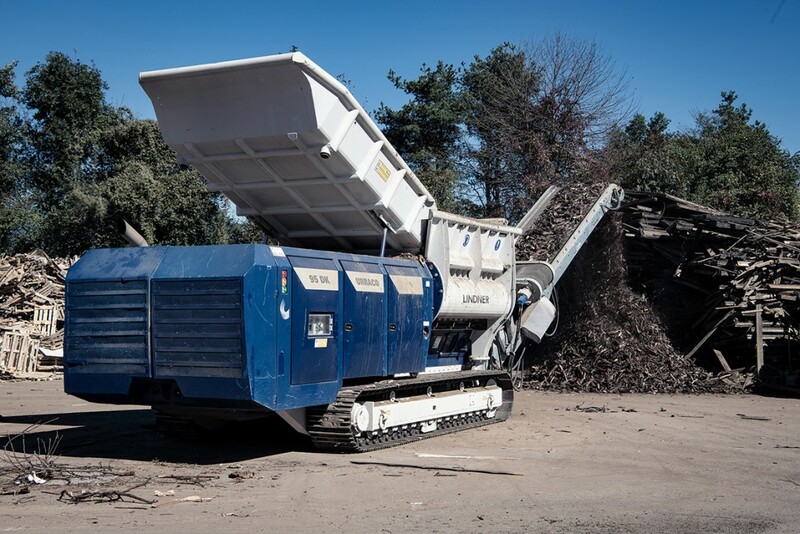 The tracked Lindner mobile twin shaft shredder, featuring two speeds and an intuitive radio remote control, has already processed more than 24,000 metric tonnes of waste wood, including more than 10,000 metric tonnes of decommissioned railway sleepers. Gojer's input material is acquired from Austria as well as neighbouring European countries. After shredding, the material is transported to an incineration plant in Austria, which is the country's only facility fitted with a special filtering system for the incineration of treated railway sleepers. The Urraco 95 DK is designed for high throughput rates and is capable of generating a higher output, i.e. more of the facility's capacity could be utilized should more waste become available on the market, notes Oskar Preinig, Managing Director of Gojer, Kärntner Entsorgungsdienst GmbH. He also added that "depending on the requirements and the material, the machine can shred 140 metric tonnes of waste wood per hour." Oskar Preinig knows of no other shredder as powerful as the 770-hp Urraco 95 DK, especially for processing railway sleepers. "Railway sleepers are made of very hard wood," says Preinig when asked about the challenges facing the shredder. "This wood does not break as easily as other types and is therefore much more difficult to shred than conventional waste wood. The Urraco 95 DK accomplishes the task with flying colours and is extremely resistant to unshreddables." Railway sleepers often contain iron plates, screws and nails. In the facility in Carinthia, these elements are separated from the material flow post-shredding by downstream overbelt magnets. "The metal parts in the input material represent an additional challenge for any shredder," admits Oskar Preinig. "But they don't faze the Urraco 95 DK. It is always impressive to see how the shredder processes these iron parts without suffering any damage." Gojer was particularly impressed by the fact that during its first year of operation, the Urraco 95 DK only required its first shaft change after 900 operating hours. "That's a long time considering the amounts we process," says Preinig. "The machine is also very cost-effective if you weigh up performance and fuel consumption." To achieve maximum engine output, the machine's powerful hydraulic system is equipped with a Lindner two-tower planetary gearbox. That is why the compact and robust Urraco 95 DK is able to effortlessly achieve the required output size of 150 millimetres. This was also confirmed by operations manager Florian Kordesch, who once again reiterated the stability of the shaft system, which features a shaft length of two x 2,500 mm and fourfold crushing and cutting action per shaft rotation. The automatic and load-dependent reverse mode is also an indicator of the machine's cost efficiency and commanding performance when it comes to unshreddables. As Florian Kordesch puts it: "Lindner has kept its word. What's more, we completed almost 900 hours of shredding with the first set of shafts: an incredible performance." Operations Manager Florian Kordesch, machine operator Stefan Pinter and Managing Director Oskar Preinig of Gojer, Kärntner Entsorgungsdienst GmbH in front of the mobile shredder Urraco 95 DK of Lindner. According to machine operator Stefan Pinter, machine failures due to unshreddables can be ruled out. The tearing hooks always pull in the sleepers uniformly and very efficiently. Furthermore, the Urraco 95 DK is hardwearing, maintenance-friendly and, according to Pinter, easy to operate. "It's possible to operate the machine entirely from the wheel loader, which is used to feed the shredder. Only one person is needed to operate and feed the machine," says Pinter. "The joystick remote control and the touch display on the machine itself are really convenient and extremely easy and intuitive to use." For Oskar Preinig, investing in the Urraco 95 DK mobile shredder paid off right from the start. And after using the machine for one year, he concludes that the shredder has significantly reduced costs per metric tonne. He is also keen to stress its performance and efficiency: "The Urraco 95 DK does its job perfectly." But what is even more important to Gojer's managing director is the fact that in Lindner, his company has found a trustworthy partner. "Lindner, like Gojer, is a Carinthian family business. We are proud and delighted to be able to realise this project together with Lindner," explains Preinig, emphasizing the two companies' unique relationship of trust.